Italian lawyer; born in Padua Sept. 4, 1842; died at Terni June 11, 1901. Before he had completed his academic career he left the university in order to fight under Garibaldi. He served in the war with distinction, and on his return completed his law studies, and then opened an office at Padua, where he soon became one of the most popular lawyers. For many years he sat in the Italian Chamber, representing first Belluno and then Conegliano. For some years he was president of the Jewish community of Padua. He was created commander of the Order of the Crown of Italy. 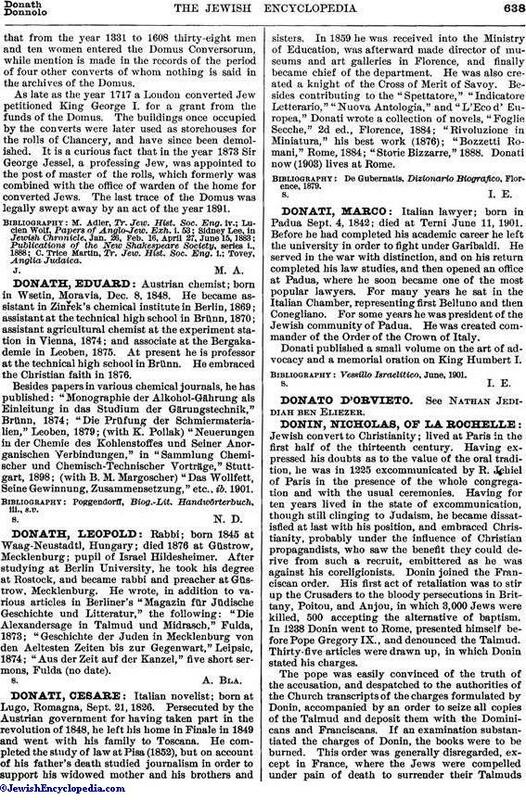 Donati published a small volume on the art of advocacy and a memorial oration on King Humbert I.